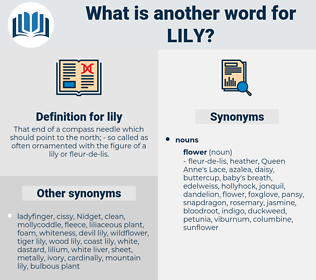 What is another word for lily? That end of a compass needle which should point to the north; - so called as often ornamented with the figure of a lily or fleur- de- lis. Now that her curiosity was satisfied, Penny had not the slightest desire to linger near the lily pool. Then Rose jumped right at Lily and threw her down on the ground, and dragged her back again. lh, leeway, lu, leal, low, loewi, L, Lilley, lii, lay away, lieu, lulu, lyly, lee, loyola, li, lie low, le, Leo I, lay, la, lulli, loll, Leo Iii, loyally, lull, lei, loo, lillie, liao, lye, laelia, lahu, lwei, loyal, lolly, lally, luo, lowell, leo, ley, law, lauhala, liii, lilo, lille, Lili, lao, liley, layia, lah, lolo, lea, lully, lie, lowly, loewe, Lilli, Lilly, luyia, leu. 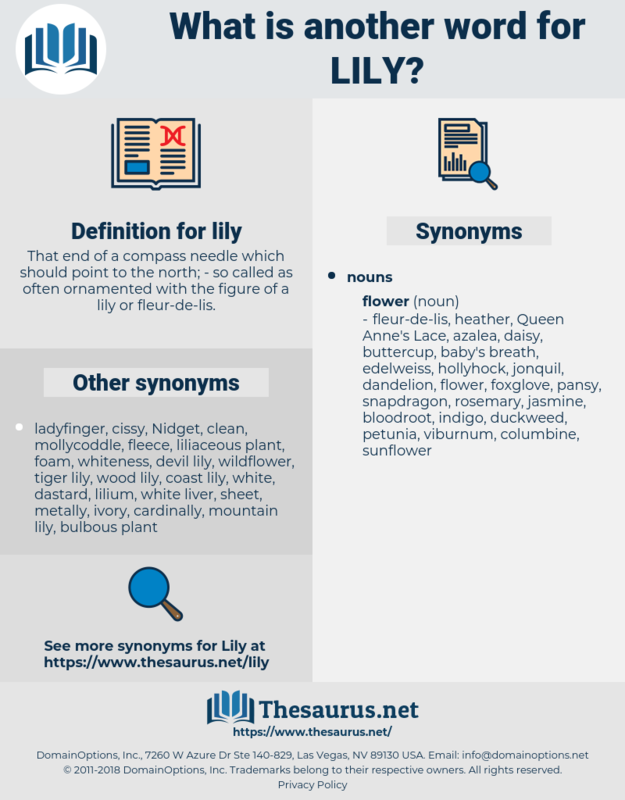 Lilium Columbianum, Lilium Catesbaei, Lilium Pardalinum, Lilium Canadense, Canada Lily, tiger lily, Lilium Candidum, leopard lily, wood lily, turk's-cap, Lilium Longiflorum, Lilium Martagon, Lilium Maritinum, wild yellow lily, Turk's Cap-lily, Easter Lily, white lily, kentan, coast lily, meadow lily, mountain lily, annunciation lily, Lilium Auratum, martagon, Lilium Lancifolium, panther lily, devil lily, lent lily, Madonna Lily, Lilium Philadelphicum, Oregon Lily, pine lily, Lilium Superbum, Bermuda Lily, white trumpet lily, wild meadow lily, Columbia Tiger Lily, Lilium Michiganense, Michigan Lily.